High Park’s always been known for its natural beauty, community friendliness, and cozy, locally owned shops. What’s less known is that it’s also a neighbourhood absolutely packed with services and conveniences, where everything a busy professional—or a growing family—will need is at your fingertips in just a few short blocks. So this week, we’ll make one of the trickier parts of moving easy and get to know a new neighbourhood: High Park. The first thing you’ll need after settling into your new condominium unit: groceries! High Park’s grocery offerings run the range of budgets and selections: dotted with local fruit and vegetable markets, and featuring a Cobs Bakery and bulk store, the Bloor Street strip has everything you’ll need without the long grocery-bag haul home. High-end Fresh and Wild brings organic produce, wild-caught fish, and touches like fresh-squeezed orange juice to the neighbourhood for the vegetarian or super-healthy eater, while a small No Frills just east of Runnymede Station—and a much larger, brighter one at Pacific and Dundas, just a few minutes away—more than cover the basics affordably. For the drinks, the High Park neighbourhood also features a large, recently renovated LCBO outpost at Bloor and Runnymede. In case you need cough medicine—or emergency toiletpaper!—the Bloor and Durie Shoppers Drug Mart is open almost every night until 10:00 p.m. As well as the usual household and pharmacy offerings, the Bloor West location has seasonal flu shots, a beauty boutique, and a certified diabetes educator on staff. High Park Pharmacy at Bloor and Quebec Avenue—right at High Park Station—offers an impressive range of services to neighbourhood residents, including automated prescription transfer, telephone and online refill orders, breast pump rentals, regular clinic days, and even prescription delivery for busy parents or seniors whose mobility isn’t what it used to be. The pharmacy is also home to one of the neighbourhood’s two Canada Post locations—with the other at Bloor and Windemere. More specialized shipping—or a place to pick up that must-have online order—is also available at the neighbourhood’s UPS Store, west of Runnymede. High Park Village is also practically guaranteed to have easy local bank branches, wherever you do business. There are large branches for almost every major bank along Bloor, with two TD Canada Trust branches (at Runnymede and at Jane), a Bank of Montreal at Bloor and Willard, a Scotiabank at Bloor and Durie, and an RBC at Bloor and Windemere. Finally, transit is a snap in High Park Village: Sandwiched between two subway stops, with multiple north and south bus routes available, it’s a hub for TTC riders. What’s more, for those out-of-town getaways—or visits to family at home—High Park is just a few stops west of GO Transit’s refurbished Dundas West/Bloor station and the Kitchener/Georgetown line, and a few stops east of non-stop TTC shuttle service to Pearson International Airport. High Park Village has a wide selection of eats for such a cozy main street strip, ranging from burgers to tapas, all-raw food to sushi—and the grilled cheese sandwiches at the Grenadier Café. Locally-owned pub The Yellow Griffin, just a short walk east at Runnymede Station, has been a part of the High Park strip for over thirty years. With a kitchen that’s open until 11:00 p.m., they’re a great bet for late-night eats, and offer live music, sports events, board game afternoons, a free-to-book upstairs party room, and a massive burger menu with what might be the city’s widest selection of gourmet toppings (mango chutney! Jack Daniels and peppercorn mayonnaise! caramelized onions!) on truly delicious burgers. Brunch is the best kept secret across the street at the Kennedy Public House, a gastropub with seasonally rotating menus, bread sourced exclusively from the Cobs Bakery down the street, a well-balanced drinks menu that emphasizes beer, and a bright, airy, comfortable room. Highlights include jalapeno blueberry cornbread, a solid entry into the Eggs Benedict category, and a cinnamon bread pudding that’s worth coming back for. When it comes to the most important substance—coffee!—there’s also plenty of selection in High Park. Second Cup and Tim Hortons both have outposts just east and west of Jane respectively. For freelancers or general lovers of indie coffee shops, organic and fair trade coffee is available at Café Novo at Bloor and Parkview Gardens; their gorgeous Elektra espresso machine, friendly and unpretentious atmosphere, Foodbenders sandwiches, and specialty drinks (try the Latte au Miel!) make them a great hangout or work spot. The High Park neighbourhood has a great selection of gyms and workout spots—the biggest one being the park itself, which offers outdoor zumba classes, bike groups, fitness boot camps, and yoga classes seasonally. It has some of the most extensive public sports facilities in Toronto, including tennis courts, a fishing pond, baseball diamonds, soccer fields, outdoor swimming, and long cycling paths—basically a rec league in your back yard (and yes, there are rec leagues too!). For the chilly winter months, Think Fitness Studios just west of Jane offers balanced, no-nonsense, personalized workout routines, yoga classes, nutritional assistance—and special mom and baby classes—while east of Runnymede, System Fitness provides a more general gym experience, combining machine rooms, a women-only room, hip-hop classes, an indoor track, sauna, yoga, pilates, and more in 35,000 square feet of space. For the days when you want to kick back or go exploring, High Park has a lot of laid-back—and free!—fun to offer. 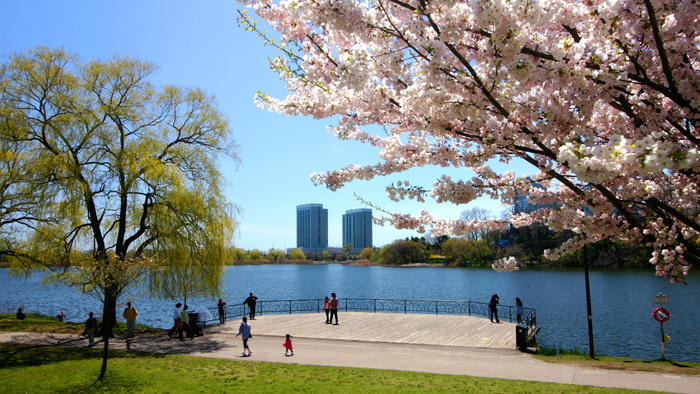 The park itself hosts an annual cherry blossom festival in late April or early May, and contains the High Park Zoo, an off-leash dog area, community garden plots, nature hikes, and summer camp for the kids. It’s also an epicentre for culture: Canadian Stage’s Shakespeare in High Park is a perennial summer favourite with theatre lovers at an affordable price. Pack a picnic, pull up a blanket, and watch Shakespeare’s finest fall in love—or stab each other to bits on alternate nights.